This year was a great year for berries and I made all kinds of berry desserts with my farmers’ market finds, from berry cobblers to strawberry shortcakes. When my berries were less-than-perfect, I turned them in to quick batches of syrup or jam to make sure they didn’t go to waste. Homemade jam is always a great use for fresh fruits and berries, and you’ll never know that the berries may have been a bit blemished (like end-of-season berries) when they started out. I put it onto toast, scones, waffles and ice cream, and I have even swirled it into cake batter. These Blueberry Swirl Cupcakes are buttermilk cupcakes with a swirl of blueberry jam running through them, giving the cupcakes a summer berry flavor and a colorful swirl – without loading them up with whole berries and turning them into muffins. I used a very quick microwave jam that takes just a few minutes to make for this recipe. It isn’t quite as thick as more traditional jam recipes – but it is perfect when you want something fast and only need a small batch for something. That being said, it is even easier to use storebought jam or preserves, so any brand of blueberry preserves is a good way to get a nice berry swirl into these cupcakes. 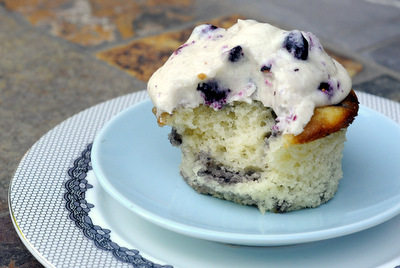 The cupcakes are very moist, with a rich buttermilk flavor that is a nice background for the blueberries. The preserves may sink slightly as the cupcakes bake (particularly if you have a thick preserve with big chunks of fruit in it), so take care to only swirl them into the top portion of the batter before baking. I wanted to highlight the blueberries even more by incorporating them into the frosting, as well. Fresh blueberries make a great garnish, but they’re not ideal for blending into buttercream because they contain a lot of juice and will really change the consistency of the frosting. Instead, I opted to mix in some freeze dried blueberries (available at natural food stores and Trader Joe’s). These dried berries have a lot of flavor and will rehydrate just enough to make them tender in the frosting. 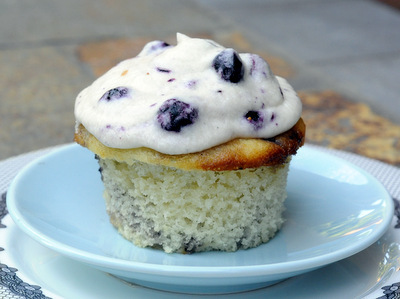 If you can’t find them, use vanilla buttercream and simply garnish with fresh blueberries to get some blueberry in every bite and to add a splash of color to the top of the cupcakes. In a large bowl, using an electric mixer, beat the butter and sugar together until light and fluffy. Beat in the egg and the vanilla extract until well blended. Add half of the flour mixture to the butter mixture and stir until almost combined. Add buttermilk, followed by the rest of the flour and mix until no streaks of dry ingredients remain. Divide batter evenly into muffin cups. Top each cup full of batter with 2 tsp of blueberry preserves and swirl in slightly with a toothpick. Bake for 18-20 minutes at 350F, until a toothpick inserted into the center of a cupcake comes out clean. Turn cupcakes out onto a wire rack to cool completely before frosting. In a large bowl, beat together butter, milk and vanilla extract. Gradually blend in the sugar until the frosting is thick, smooth and has a spreadable consistency. Beat in the freeze dried blueberries until evenly incorporated. Combine all ingredients in a medium sized microwave-safe bowl. Cook on high for 1 minute, stir and cook for an additional 60-90 seconds, until syrup is bubbling and slightly thickened. Allow to cool completely before using. Serves 2-3. Can be doubled as needed. The cupcake looks heavenly. I’m not sure where I can find buttermilk in Paris though. Can I substitute buttermilk with yogurt/yogurt drink? Thanks! I’ve always thought blueberries and muffins are the perfect match but will give these a go! I agree – that cupcake looks heavenly. I’m crazy about blueberries and I could feel my teeth sinking into that frosting. I’ve got to try this recipe. Thanks. This sounds wonderful, especially the frosting! Thanks for the cupcake recipe! 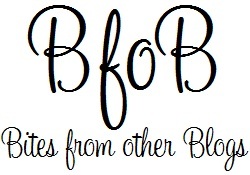 I like to bake it tomorrow~ lol It’s a good idear to use freeze dried blueberries. 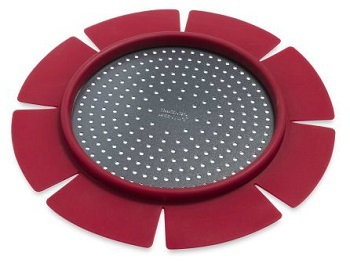 I really agree with you~ Freeze dried fruits are very suitable for baking.